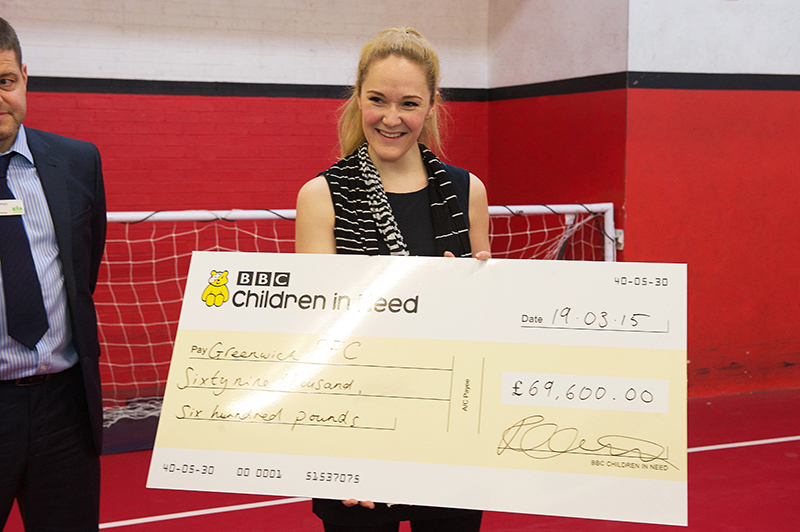 On Thursday March 19th Ruth McDermott from BBC Children in Need came to The Waterfront Leisure centre Powerchair training session to present Greenwich Powerchair Football Club with a cheque of £69,600 for 3 year’s funding. Above. From left to right on photo of Cheque presentation. 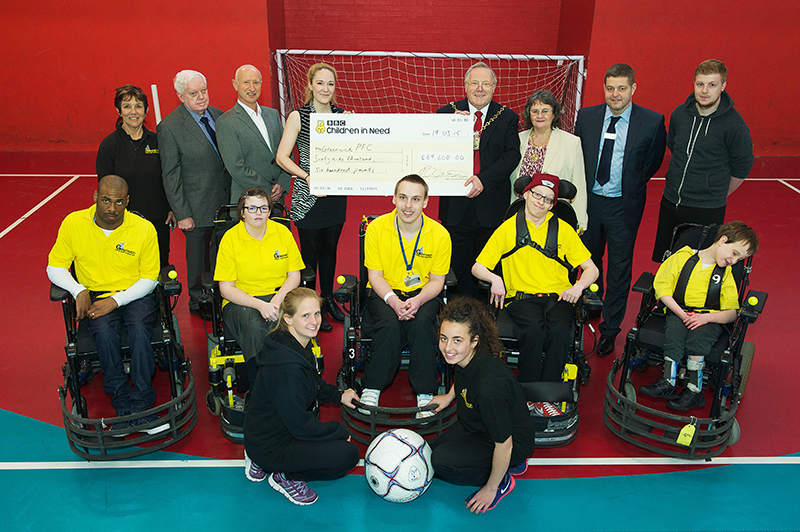 Sharon Brokenshire MBE (Director); John Fahy (Deputy Leader, RBG); Steve Johnston (Strategic Development Manager, SLSL); Rachel (BBC CIN); Mick Hayes (Mayor of RBG); Gill Hayes (Mayoress, RBG); Sam Wright (General Manager Waterfront LC); Joe Sheehan (Volunteer); Liam Prospere (Player); Emily Campbell (Player); Kieran Gibbons (player); Shea French Gibons (Player); David Gale (player); Rhea Daly (Head coach); Jessca Landeryou (assistant coach). 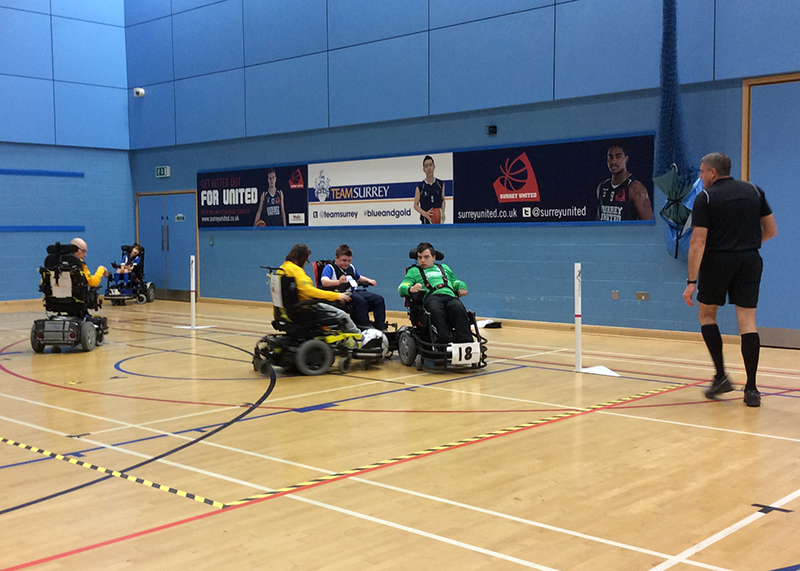 Sunday, January 18th 2015 at Surrey University Sports Centre. 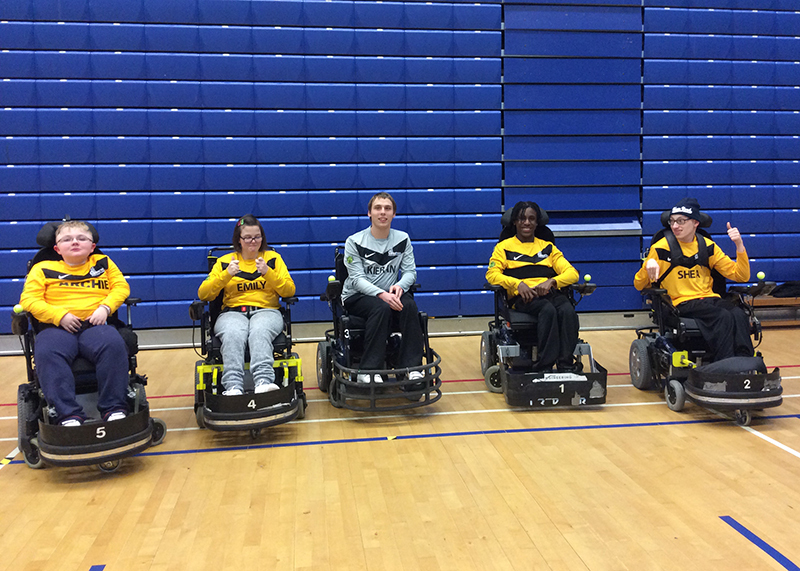 Greenwich Powerchair Football Club played two League matches and a Cup match. Currently top of the league with Invicta 2 points behind, they needed to win all games to maintain their position. First game was against Swindon with a 2-0 win; Shea French-Gibbens with the first goal, from a corner delivered by Kyle Alexander, who went on to score the second. Second game shortly followed with a 5-0 win against Norwich; Kyle Alexander scoring four goals, two from a first time spin kick from the opponents goal kick, as well as an own goal. 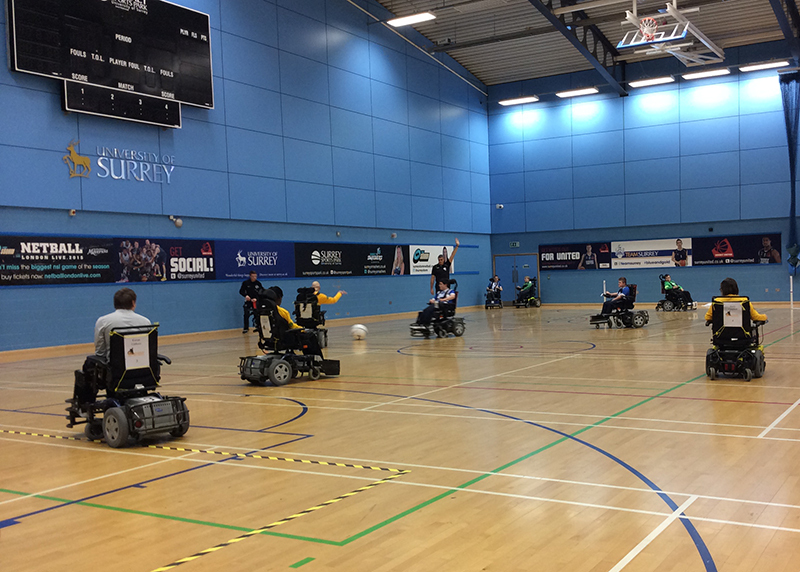 Greenwich Powerchair Football Club remain in first possession with 16 points from 5 wins, 1 draw. 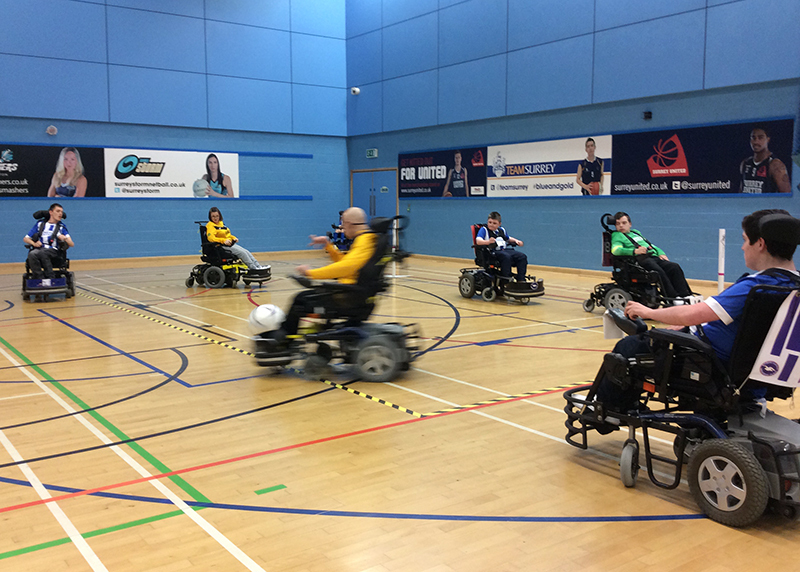 The Cup game was against Brighton & Hove Seagulls. Shea French-Gibbens, once again scoring from a corner delivered by Kyle Alexander. In the second half Emily Campbell made a brilliant run with the ball towards the near post, bringing the goalkeeper and defender across to make the save before flicking the ball back across the goal line to Archie Jones to score, at the back post. Emily Campbell then completed her game with goal of her own from a corner, and a successful 3-0 win to Greenwich PFC.